Provide comfort for the family of Axel Davis with a meaningful gesture of sympathy. 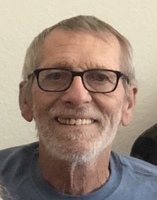 Axel Davis passed away on April 7th, 2019, just after finishing his last beer with his best friends. He was born in Iowa and had great friends that he grew up with. Many of them have been able to share time with him while visiting in Arizona. He was a kind and generous man who always wanted to help others. He was known for his talents with tools and motors. He would get joy out of fixing whatever his friends needed. He loved his work as a Building Maintenance Mechanic, and was proud to be a Building Engineer in his latest position. Having diabetes gave him serious challenges throughout his life and he was always tired of the needles, but accepted it. He got enjoyment from his family, friends, playing dominoes and cribbage, and of course his beer and scratcher tickets out on the patio. He met his wife Nancy in Manhattan Beach, California, while being apartment neighbors. They married in 1981 and moved to Arizona in 1985, with their daughter Jessica. In 1987, their son Kyle was born. He was a fantastic dad, doing childcare and diaper changes like it was second nature. He was always so proud of his children’s many accomplishments. He is loved and will be greatly missed, and our memories will keep him in our hearts. We would like to thank Hospice of the Valley for their compassionate care in his final days, and his friends who were here to share in some fun and love with him. We encourage you to share your most beloved memories of Axel here, so that the family and other loved ones can always see it. You can upload cherished photographs, or share your favorite stories, and can even comment on those shared by others. Provide comfort for the family of Axel Davis by sending flowers. I'm both proud and privileged to have know Axel as a neighbor and a friend. I was Nancy's roommate and Axel's neighbor. Who would have thought the two of them would have been together almost 40 years. I remember him as quiet and kind. I know he is at peace and with friends and family in Heaven.